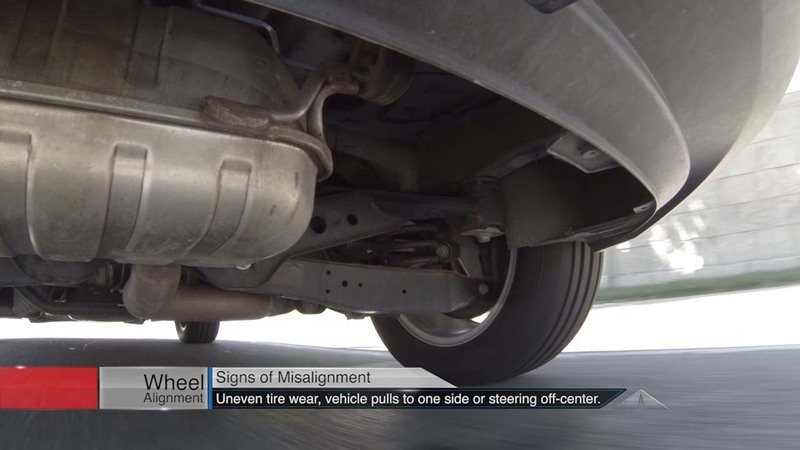 Uneven tire wear, the car pulling to one side or a steering wheel that is off-center are signs for Placentia car owners that their wheels may be out of alignment. When doing an alignment inspection, the service professional will review your tires for uneven wear as well as suspension and steering parts for signs of wear or damage. He’ll also compare your current alignment with the auto maker’s settings. Your vehicle owner’s manual will have a recommendation for when to check alignment. Of course, this recommendation is based on normal driving. If you have been in accident, hit a curb/pothole, frequently drive off-road around Placentia, or notice any symptoms of misalignment, have your Exclusive Motors service professional complete an essential alignment check. Imagine you’ve left Placentia and you’re up in the arctic on a dog sled. The same is true of your Mercedes – Lexus when the wheels are out of alignment. That wheel that’s pulling to the side is dragging down the rest of the car; so you push a little harder on the gas pedal to keep up your speed. You’re wasting gas. So have your wheel alignment checked at least once a year. It is vital to get it checked right away if you feel the car pulling to one side. Sometimes we Placentia motorists bump a curb or hit a pothole and knock our wheels out of alignment. An accident can take the wheels out of alignment as well. Placentia auto owners need to make sure they’re tracking straight. You’ll get better fuel economy and your tires’ll last longer. Now, mush! Many Placentia car owners have been hearing about technological advances in power steering, specifically, electric power steering. Some very high-end cars have been featuring electric power steering for a few years now. An electric motor directly provides the power assist to make steering easier. Undoubtedly we’ll see much more of this in Placentia as full electric cars and electric hybrids become more common. The vast majority of cars and trucks serviced at Exclusive Motors in Placentia use a hydraulic power boost system. With hydraulics, fluid is pressurized by a pump which actuates a hydraulic cylinder to reduce steering effort. Some of these pumps are powered by an electric motor. Most pumps are powered by the serpentine belt driven by the engine. Power steering fluid has the necessary hydraulic properties and the ability to lubricate the internal parts. The power steering fluid also protects Mercedes – Lexus components from rust and corrosion. Placentia car owners should be aware that automobile manufacturers recommend that the fluid be replaced on schedule. At Exclusive Motors, the old fluid is drained and the system cleaned thoroughly. Fresh fluid is then installed. Unfortunately, many Placentia car owners don’t realize how important it is to service their power steering, and some may not even know that it’s necessary in the first place. A neglected power steering system can develop leaks that will shorten the life of the pump. Placentia drivers should be aware of warnings that indicate possible power steering problems: the need to constantly add power steering fluid, a loud whining from the pump, erratic power assist or high steering effort. If you’re experiencing any of these problems, have your power steering checked out at Exclusive Motors in Placentia. In addition to the pump and hydraulic system, there are vital mechanical parts in the steering system. The rods, arms, joints and knuckles that actually turn the wheels can become worn or damaged. A standard alignment service at Exclusive Motors includes an inspection of steering components. If you notice any play in the steering wheel, that the steering wheel is off center, or a noise coming from your front wheels, especially when turning, have your Friendly Exclusive Motors tech do an inspection so the problem can be corrected. Waiting too long could cause uneven tire wear and may even lead to steering failure. Call Exclusive Motors today at (714) 795-3065. There are several things involved in an alignment check. First, there’s an inspection of the steering and suspension – it should be checked to see if anything’s bent or broken. Then the tire condition needs to be inspected. From there, the vehicle is put on an alignment rack and an initial alignment reading is taken. If all four wheels are adjustable, they are lined up perfectly parallel with the vehicle’s center line. If the back wheels aren’t adjustable, a technician at Exclusive Motors can determine the direction they push and then aligns the front wheels to match. When all of your vehicle’s wheels are lined up exactly with each other, your wheels are in alignment. Hitting a road hazard or even just the normal bumps and bounces of everyday driving in Placentia can cause your Mercedes – Lexus’s wheels to be out of alignment. Driving for an extended time in Placentia when your wheels are out of alignment results in uneven tire wear. This is dangerous … and expensive. Worst case scenario, you have a blowout on a crowded California freeway. It can also cause premature wear to your suspension system, which can be really expensive to repair. At the very least, you may have to replace your tires years too early. The ideal alignment for your Mercedes – Lexus was designed by its engineers. Alignment service at Exclusive Motors starts with an inspection of the steering and suspension – to see if anything’s bent or broken. Then your Friendly Exclusive Motors technician will look at tire condition. From there, the Mercedes – Lexus is put on an alignment rack and an initial alignment reading is taken. The wheels are then aligned to Mercedes – Lexus manufacturers’s specifications. Your Mercedes – Lexus owner’s manual probably has a recommendation for how often your alignment should be checked – usually every couple of years. If you suspect an alignment problem, get it checked at Exclusive Motors before you suffer expensive tire or suspension damage. You may have an alignment problem if your car drifts or pulls to one side, your steering wheel’s off center, you have uneven tire wear or your car doesn’t feel like it handles right as you drive down our local Placentia California streets. When all of a vehicle’s wheels are lined up exactly with each other, your wheels are in alignment. Running into potholes, smacking a curb or other objects around Placentia, California are great ways to knock your car out of alignment. Then one or more of your wheels starts pulling in a slightly different direction and the problems begin. At the very least, you’ll have to replace your tires sooner. You could end up with premature wear to your suspension system, which can be really expensive. The front wheel alignment is adjustable on all vehicles, and the back wheels are also adjustable on some cars. So, what is involved in an alignment check at our Placentia California auto dealership? First, there’s an inspection of the steering and suspension to see if anything is bent or broken. Tire condition will also be evaluated. Like most things, your manufacturer has suggested a mileage interval for having your alignment checked. But if you run into a curb, pothole or something else that’s given you a big jolt, pay attention to whether your vehicle is pulling to one side when you drive around the Yorba Linda area. It’s better to have your alignment checked before waiting to see if there is uneven tire tread wear – by then, the damage is done. Come see us at Exclusive Motors for more information about your tire alignment. We look forward to seeing you. Wheel alignment is often overlooked by busy Anaheim and Villa Park car owners until serious tire damage has been done. One wheel can be knocked out of alignment from the rest by hitting a curb or pothole on Yorba Linda roads. When a vehicle’s out of alignment, one or more of the wheels does not track true and pulls against the others. The tires will wear out very quickly and will need to be replaced prematurely. It could also lead to Mercedes – Lexus suspension damage. But the big issue for Anaheim, Villa Park, and Placentia motorists is safety. When your Mercedes – Lexus wheels are out of alignment, the vehicle will pull to one side, which could lead to an accident. When you’re out of alignment, you should have it taken care of right away at Exclusive Motors in Placentia. At Exclusive Motors, your vehicle is put on an alignment rack where the tires, steering and suspension parts are checked for damage. Then the alignment is charted and checked against the factory settings. Adjustments are made to bring the wheels back into alignment. This gets all four wheels going in precisely the same direction. Signs of alignment problems are: Your car pulls to one side. Also, your steering wheel may not be centered when you’re going straight. If you see the edges of one or more tires rapidly wearing down, you should have your Yorba Linda service center look it over. If you’ve been in an auto accident in California that involved a wheel, you should get your alignment checked. A big jolt can seriously knock things out of alignment, but Anaheim drivers also need to understand that a series of smaller ones can add up. That’s why your manufacturer recommends periodic alignment checks. If your Mercedes – Lexus owner’s manual doesn’t specify, once a year might be appropriate. Or check with Ron Erickson or your service advisor at Exclusive Motors in Placentia. One thing’s for sure: the cost of the alignment at Exclusive Motors is cheaper than having to buy a couple of new tires because of neglect. Armed with the answers to these questions, you can start a trip inspection to help you prepare your Placentia vehicle for your big adventure. A lot of our Placentia customers prefer to go through this exercise with an automotive service advisor at Exclusive Motors to get their input and make sure they haven’t left anything out.